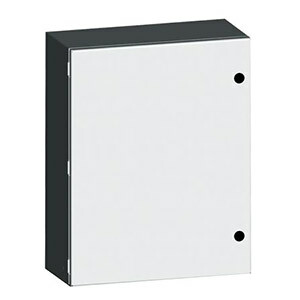 NEMA Type 4 Junction Outdoor Electrical Enclosures, Sizes from 6x4 to 20x20. Viewing Window Available in 10"x 8" to 20"x 20"
NEMA type 4 electrical enclosures and cabinets can be uses indoors or outdoors. These enclosures are designed with hinge pins for easy door removal and have standoffs for mounting sub-panels. They are designed to house electrical controls, instruments and components in areas, which may be regularly hosed down or are in very wet or oily conditions. The SCE-ELJ series electrical enclosure and cabinets provides protection against windblown rain and dust, splashing or hose directed water, and external formation of ice. ANSI-61 gray powder coating inside and out over phosphatized surface. Optional panels are powder coated white. Pre-cut DIN rail for 4" wide enclosure, actual width 2.75"
Pre-cut DIN rail for 6" wide enclosure, actual width 4.75"
Pre-cut DIN rail for 8" wide enclosure, actual width 6.75"
Pre-cut DIN rail for 10" wide enclosure, actual width 8.75"
Pre-cut DIN rail for 12" wide enclosure, actual width 10.75"
Pre-cut DIN rail for 14 or 16" wide enclosure, actual width 12.75"
Pre-cut DIN rail for 20" wide enclosure, actual width 16.75"
8' Power cord with M16 cable gland strain relief, 3x16 AWG, 250Vac max.